Sony is now teasing Japanese punters about what could be a new, tiny Vaio notebook, having begun baiting New Zealanders earlier this week. Sony Japan's website now shows a statuesque young woman whip a long, thin package out of her handbag. The box slims down to an envelope and out slides an 'invite' for the forthcoming "New Mobile" launch. 'New Mobile' Vaio unboxed unbagged? The invitation is for consumers to leave their email addresses to be spammed by Sony Vaio marketing in due course. Netbook buffs are keen to see the promo as a sign Sony's about to launch a Small, Cheap* Computer. Just as likely - probably more so - is that it's going to launch a revived Vaio Picturebook, the compact notebook it launched way back in September 2000 on the back of Transmeta's first, 600MHz Crusoe processor, the TM5600. 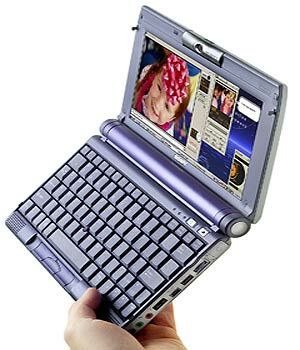 Arguably the candidate for the first netbook, the C1VN has an 8.9in, 1024 x 480 display with a 0.3-megapixel webcam in the bezel. It had 128MB of memory and a 12GB hard drive, along with VGA, USB and Firewire portage. There was no Wi-Fi, of course, but the C1VN did have an on-board 56Kb/s modem. It ran Windows ME - for up to 5.5 hours, Sony claimed at the time. No lightweight despite its 245 x 150 x 28.5mm dimensions, it weighed a gnat's todger under 1kg. Its price was weightier still: $2300. *Probably not cheap, we'd say.